Joseph Guarnerius fecit / Cremonę anno 173? The earliest historical documentation for the Prince Doria “del Gesú” goes back to 1858 when it was sold by the leading French expert at the time, Jacquot, to the Doria family. Of Spanish origin, the Doria family resided in the city of Toulouse, in southern France, and are known to have owned other fine Italian instruments including the Armingaud Stradivari. The Prince Doria has had few owners in the past 150 years. Rembert Wurlitzer sold the violin in 1950 to Leopold Godowsky Jr., son of the great Russia pianist and coinventor of Kodachrome film. After 12 years it was acquired by the Lionel Perera family for the aspiring young violinist, Zvi Zeitlin. In a letter from 1962. Rembert Wurlitzer wrote that the instrument was unexcelled by any other Guarneri violin known to him, particularly in its tonal quality. Professor Zeitlin used the violin as his concert instrument for over 40 years before consigning it to its current owners. The violin bears a Certificate of Authenticity, issued by America’s foremost expert Rembert Wurlitzer, dated October 24th, 1950. In it he warrants the violin to be original in all its parts and in an excellent state of preservation. Black and white photographs are attached to the Wurlitzer Certification with Reg No. M-127. When the Prince Doria first came to America, it was completely restored by Simone Fernando Sacconi, who placed the scroll that is currently on the instrument. In his written Authentication shortly thereafter, Rembert Wurlitzer certifies this scroll to be original and, in recent years, experts who have personally examined the Prince Doria, including the late Robert Bein, has confirmed the expected hand of Guarneri’s father Giuseppe “filius Andreae”. Giuseppe continued in the Guarneri shop after passing it to his son, “del Gesú”, in 1731 and is considered to have carved most of the original scrolls found on “del Gesú” violins in this period, as indicated by the Wurlitzer Certification. Traces of the original black edging on the bevels are still visible to this day. The Prince Doria Guarneri is widely regarded as one of the best sounding concert violin remaining by this maker. 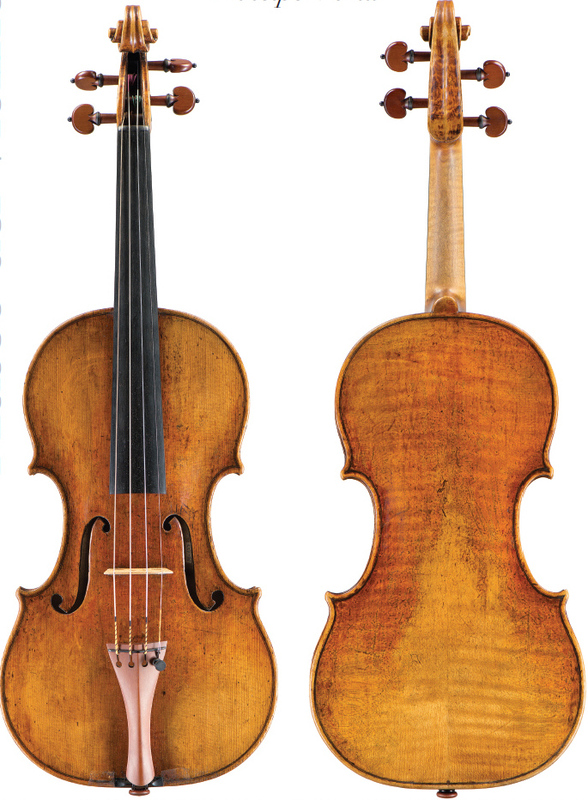 Considering the robust thicknessing shown in its graduation chart, this reputation may be the result of the violin having been spared some of the thinning and regraduation that rare strings instrument often undergo over time. Indeed, original tool marks from “del Gesù’s” toothed plane are visible on the inside of the back.